NEW ORLEANS – It’s good to be an NCAA Division II men’s cross country team in The Centennial State this week. That’s because the top-two teams in the NCAA Division II Men’s Cross Country National Coaches’ Poll, released by the U.S. Track & Field and Cross Country Coaches Association (USTFCCCA) on Wednesday, hail from Colorado, as Adams State held onto its top ranking while Colorado Mines made a leap to a season-best second place. The Grizzlies finished third at the prestigious Paul Short Run Gold race, despite competing without top runner Sydney Gidabuday. Sophomore Kale Adams paced Adams State during the race that featured over 350 competitors, finishing in sixth overall with at time of 23:44.9. Colorado Mines won the non-Division I portion of the Chile Pepper XC Festival, with all seven of its runners finishing within the top-10. Performances from Matthew Kade (30:20.5 – second), Ricardo Ocampo (30:27.6 – third) helped lead the Orediggers to unchartered territory on the season. Augustana (S.D.) also moved up within the top-10, coming in at eighth after an idle week. Grand Valley State (third), Cal Baptist (ninth) and Queens (N.C.) (10th) all fell one spot in the rankings. 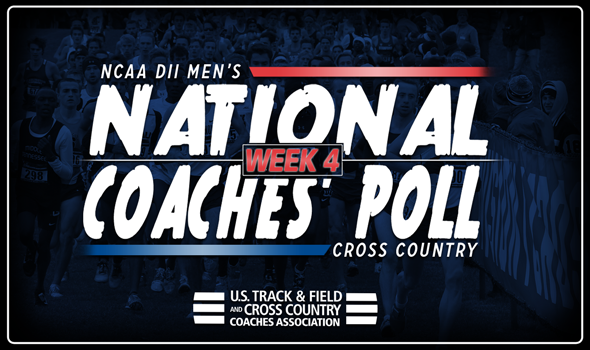 Chico State (fourth), Mount Olive (fifth), Southern Indiana (sixth) and Cal Poly Pomona (seventh) rounded out the top-10 in spots they held a week ago. Dallas Baptist leapt eight spots for the largest jump on the week by any NCAA Division II men’s program, coming in at 16th. They finished right behind Colorado Mines at the Child Pepper XC Festival with Andrew Curry (30:46.8 – seventh) finishing inside of the top-10. After falling to 15th a week ago, Lee (Tenn.) returned to 14th after a solid showing at the Royals XC Challenge. The Flyers finished second as Christian Noble was the runner-up in the race that had 192 participants. Missouri Southern also moved up one spot 22nd, while Malone entered the rankings at 25th. Missouri Southern was idle, while Malone won the NCAA Division II portion of the All Ohio Championships. Nate Boyer finished 14th overall in that race with a time of 25:22.0 to give the Pioneers its first ranking on the season.